In this episode, Ron Vanderkley speaks with David Dorhout from Iowa State University about his Agricultural Robots that include Prospero the robot farmer and Aquarius the greenhouse watering robot. Today’s agricultural equipment has been designed around a single farmer controlling large machinery. This method has its drawbacks since farming decisions have to be made at the level of the field. Nature instead is chaotic and dynamic, soil nutrients and moisture change from foot to foot. A swarm of small robots like Prospero would have the ability to farm inch by inch, examining the soil before planting each seed and choosing the best variety for that spot. Ideally, this would maximize the productivity of each acre, allow less land to be converted to farm land, and ultimately feed more people. Prospero is the working prototype of an Autonomous Micro Planter (AMP) that uses a combination of swarm and game theory to plant seeds at safe distances from one another. Dorhout’s second agricultural robot Aquarius is a greenhouse robot that autonomously waters plants using its 30 gallon tank. The robot is programed using taping on the ground of the greenhouse. David Dorhout is a graduate of Iowa State University. 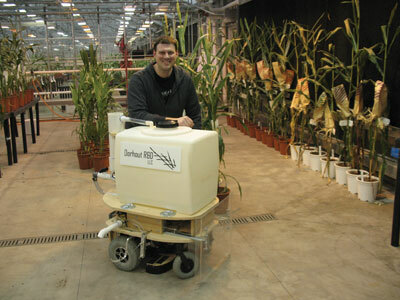 He has always been interested in robotics and has 14 years of experience in the agriculture and biotech industry doing field and greenhouse discovery work. He is the founder of Dorhout R&D LLC which is a research and development business designing and building novel robotic systems and interactive consumer electronic devices.